The depressing thing about Brecht is that his plays never go out of date. At a time when Western governments stand accused of propping up corrupt dictatorships with a lucrative arms trade, his black comedic musical on the commodification of war and the drubbing the little man takes whoever’s in charge couldn’t seem more ripe for an airing. And isn’t that just exactly what Brecht would have wanted us to think? Ever one for political provocation rather than rapt escapism, he’d probably be very pleased with that reaction. The German writer’s ideas have certainly been kept alive by Birds of Paradise Theatre Company, who employ the chapter introductions and musical interludes familiar to any student of Brechtian theatre; that the actors have something akin to an autocue screen facing the audience above their heads constantly showing the words as they are spoken below is perhaps a technique too far, as it turns out to be rather distracting and exposes the odd script slip-up. Lee Hall’s translation of that script is witty, bawdy and vibrant, and it’s brought to life never more colourfully than by Alison Peebles in the title role, who gets the lion’s share of the crudeness and most of the best lines. 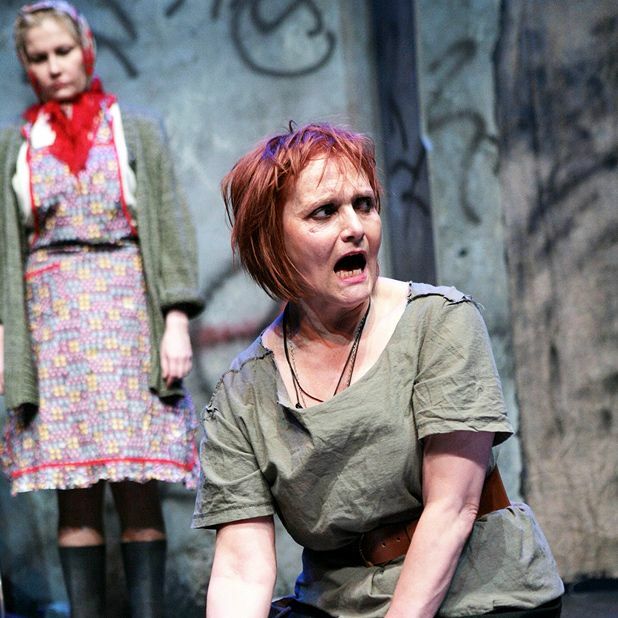 A charismatic, foot-stomping and fickle character, Mother Courage wears a thick skin of bitter wisecracks to protect her from the horrors of war: sure, she’s a caricature, but in Peebles’ powerful performance she’s one you can relate to. The rest of the show is good fun, though a few rough edges in the accents and reactions take the shine off it a little. Nevertheless, still deserving of mention are Ashley Smith, who shows great potential in showing the many shades of Courage’s mute daughter Kattrin, while Garry Robson comfortably excels as an array of comic nasty pieces of work. Bertolt Brecht's political tale of human struggle and pragmatism in the face of tragedy, presented by Birds of Paradise Theatre.